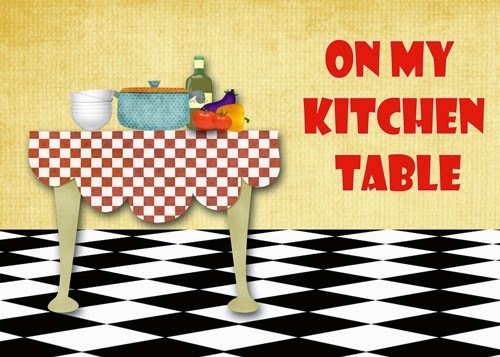 It's time for another round up of a range of products I've been sent to taste and review. It's an eclectic mix of products from small British and Irish producers and some products from established commercial brands. I hope you enjoy my reviews and maybe try some of these products yourself. Made with potatoes unearthed from the rich soil of the fenlands, twice cooked for double enjoyment and naturally flavoured with flair, these quintessentially British crisps are true Corkers. 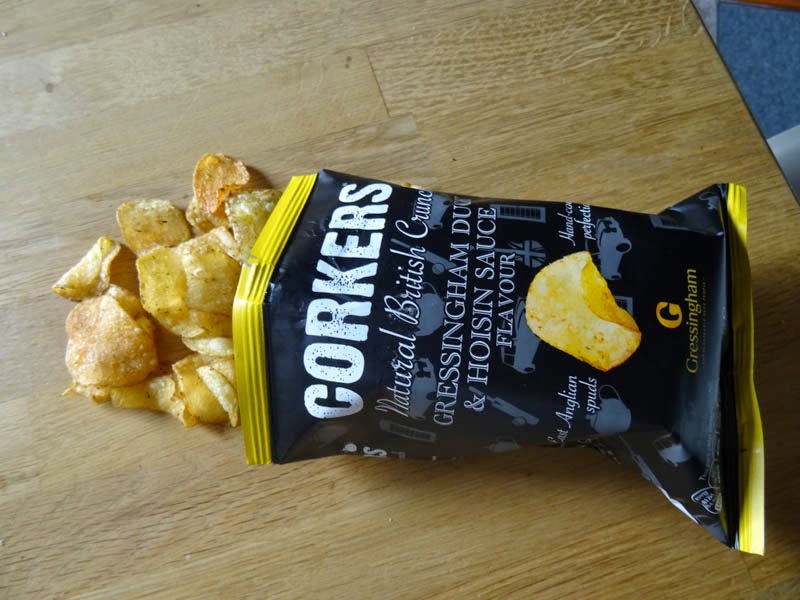 No denying it, these Corker's Crisps really live up to their name, they are super crunchy and the flavours are really tasty. Those who have read my reviews of crisps before will know that I'm not really a fan of flavoured crisps. I'm a ready salted girl, at a push I'd choose seasalt and black pepper, however these Corkers crisps have really converted me to some more varied flavours. I was particularly taken with the Gressingham Duck and Hoisin Sauce Flavour. They really did taste like duck and hoisin sauce and no artificial flavour left in your mouth afterwards. 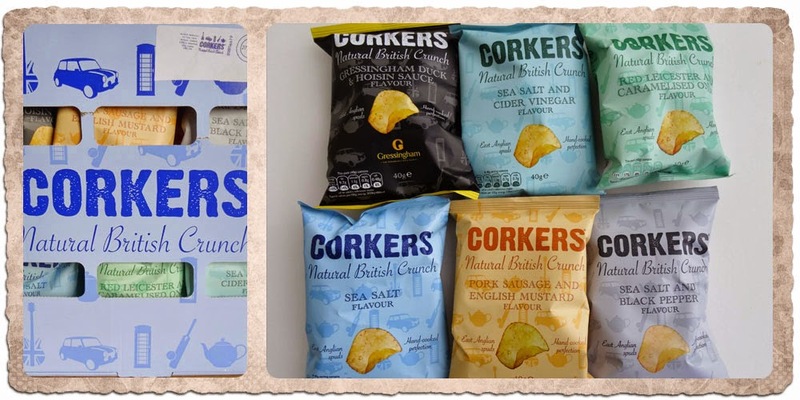 What makes Corkers crisps so special is the fact they are made from delicious Naturalo potatoes, grown in the black, peaty fenland soil of Cambridgeshire, which give the crisps a unique crunch and makes them perfect for frying. Not only are the potatoes grown on the family farm but it’s also here that they are hand-cooked to perfection. ● Gressingham Duck and Hoisin Sauce - A partnership of two British greats, the Gressingham Duck and the Naturalo potato, both hailing from the Corkers family farm. Available from selected Waitrose stores, Waitrose.com and online at corkerscrisps.co.uk. 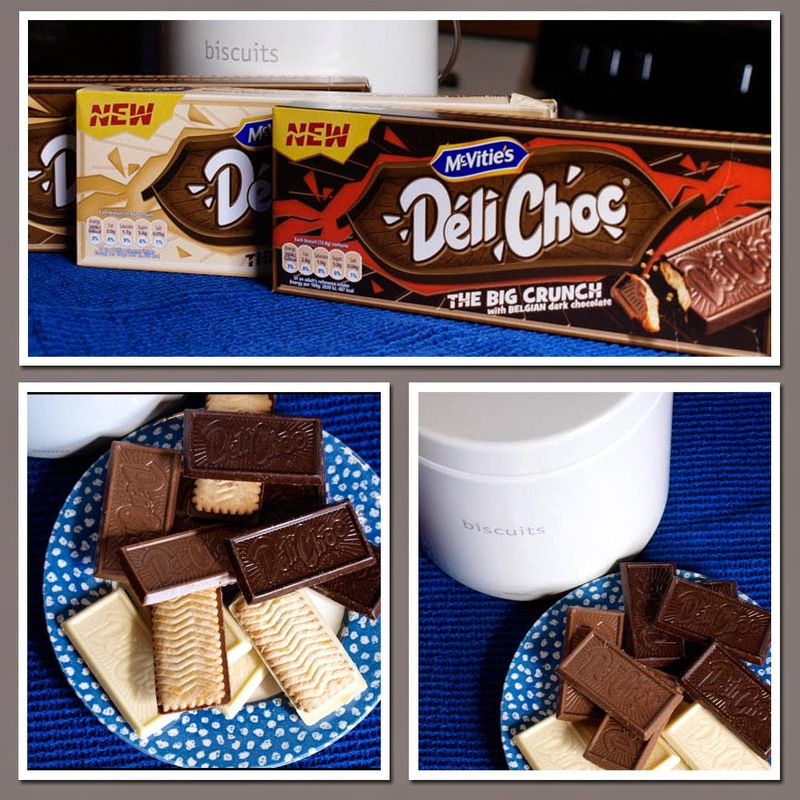 Get ready for the big crunch of the new McVitie’s DeliChoc – a welcome addition to the McVitie’s sweeet family. Crunchy biscuit topped with a thick layer of irresistible dark, milk or white Belgian chocolate, this delicious treat will provide the ultimate crunch to your biscuit eating moments. I really loved these biscuits and so did my grandsons! The chocolate is smooth and creamy and the biscuit is not too sweet and nicely crisp. Crisp, moreish and with a generous pinch of Belgian charm, the latest all-natural additions from luxury biscuiterie,Jules Destrooper, are guaranteed to satisfy any sweet tooth. With their golden lattice shape and a tasty, vanilla crunch, the classic Belgian Butter Waffles have been created from the finest natural ingredients and take their distinct flavour from a top-secret combination of spices. The perfect addition to any tea break, they¹re best shared with friends and family and are guaranteed to become a firm store-cupboard favourite. Along with mouth-watering Butter Waffles, Belgium¹s finest biscuit-maker is also treating British biscuit-lovers to its irresistible Ginger Thins. These crisp and flavoursome biscuits offer the classic ginger flavour with a delicate hint of cinnamon. 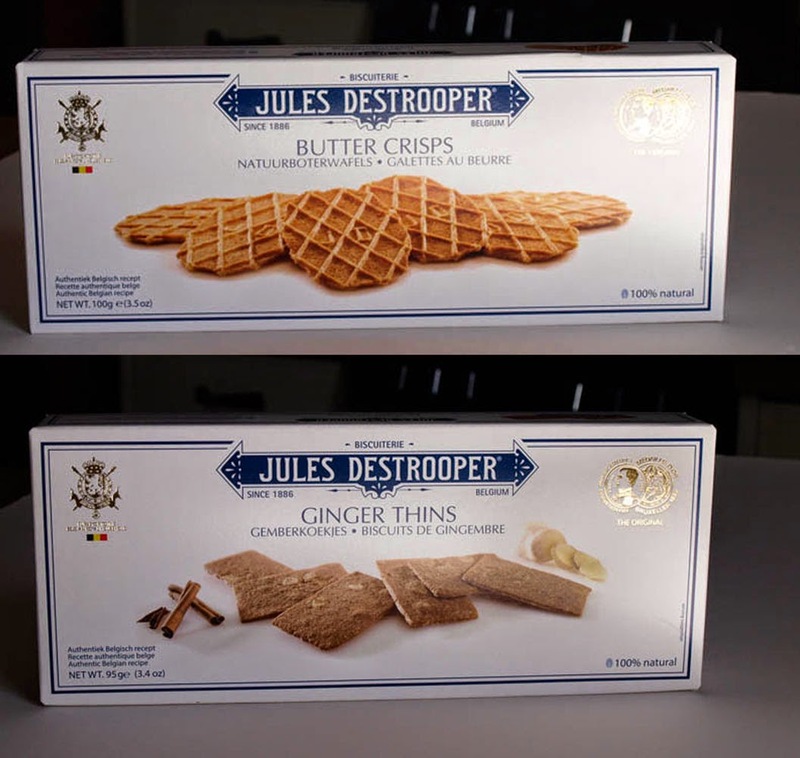 Jules Destrooper Butter Waffles and Ginger Thins are available now from Ocado. Butter Waffles RRP ￡1.65. Ginger Thins RRP ￡1.55. Check out my Ice-Cream Sandwich with Roasted Rhubarb Compote, a dish I created last year using Jules Destrooper Butter Crisps. It’s the season for Elderflower! As spring approaches, the most wonderful flowers come into season. 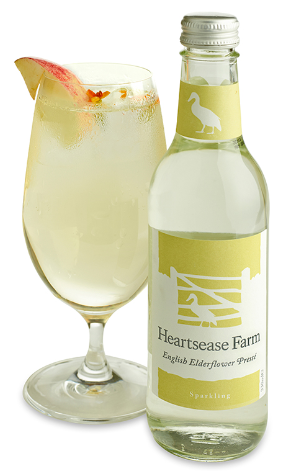 Heartsease Farm have been foraging for the very best British Elderflowers to create this utterly delicious sparkling Elderflower pressé, perfect for those sunny days. By drinking what is in season, you are getting the best of the crop, the most intense flavour and the most nutrients too. 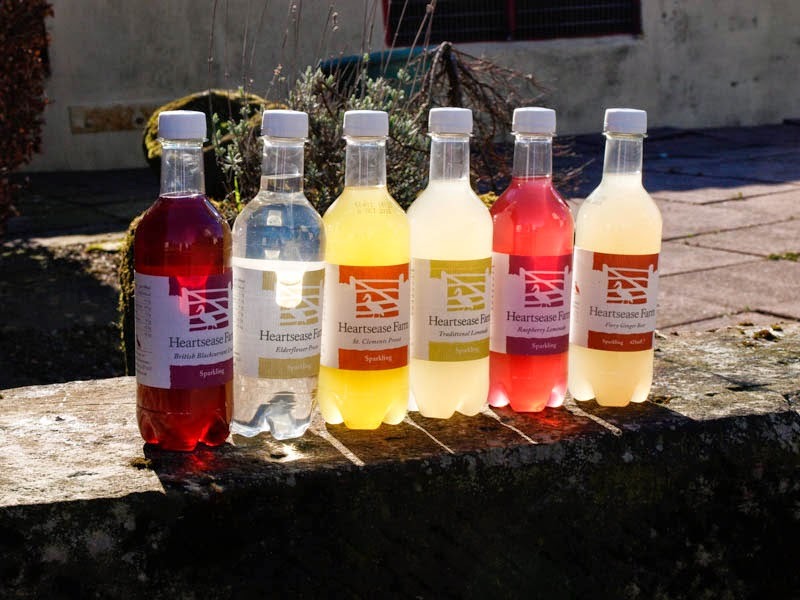 Just like all of our pressés, it’s made from all natural ingredients, so all that flavour comes from real, fresh ingredients, expertly blended with our very own spring water at Heartsease Farm in Wales. The Heartsease Farm Elderflower Presse is more delicate than some other commercial brands I have tasted. It is not overpoweringly floral and can be drunk with food without overwhelming the flavours.I also liked that it is not too fizzy, very much a presse rather than a carbonated drink. 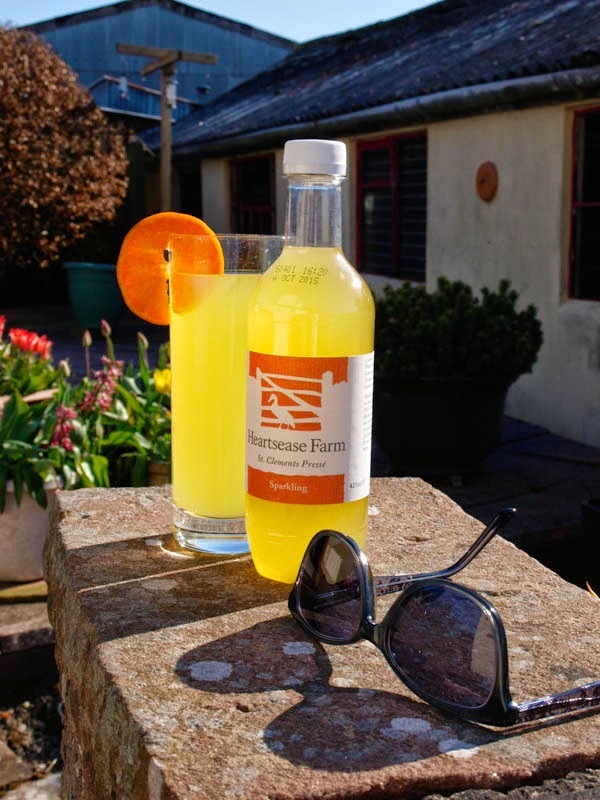 With all the sunny weather we have had, we really enjoyed these presse drinks with their light fizz and fruity flavours. 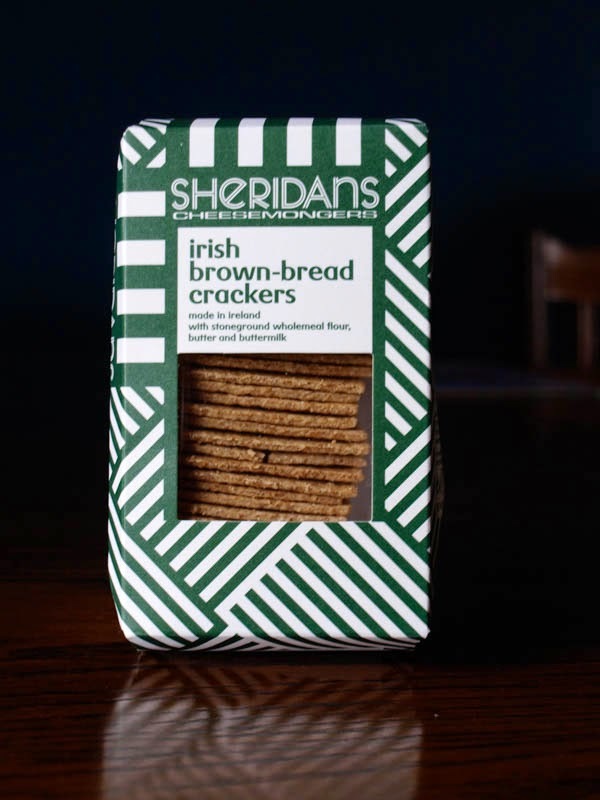 Sheridans Cheesemongers Brown Bread Crackers are flying the flag for Ireland in the new Marks & Spencer range of branded artisan foods from across the British Isles. From this week (week ending April 10), The branded artisan food range will be stocked in over 400 stores across the British isles and features an array of unique foods from small producers. Marks & Spencer set about sourcing a select range of food products from across the British Isles in early 2014 and are featuring one of Ireland’s best loved artisan brands, Sheridans Cheesemongers, in the mix. Fundamental to the creation and production of the brown bread crackers is simplicity and integrity of ingredients and process. 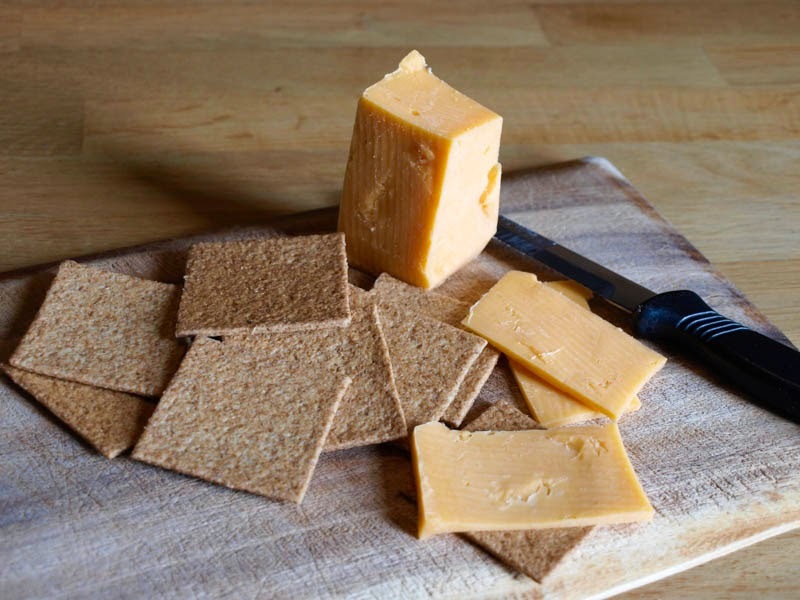 Apart from sea salt, the crackers have only three ingredients; butter, butter-milk and stone-ground wholemeal flour. These ingredients are all produced a short distance from the bakery at Clonakilty in rural West Cork. Traditional brown soda bread, baked daily in the Sheridan family home, was the inspiration for these crackers. The authenticity of the ingredients and technique produces a cracker that is crisp and delicious. Apart from being perfect with cheese, they are ideal for use with any topping or equally scrumptious by themselves. Sheridans Cheesemongers now have shops in Dublin, Galway, Waterford and Meath, where their HQ is located. They supply numerous specialist restaurants and shops; not only with great cheeses but also with a range of carefully selected artisan foods, including their own range of products to accompany cheese. Unsatisfied with the crackers available to accompany the great cheeses of Ireland and Britain, they decided to create their own. In 2012 Sheridansteamed up with artisan baker Richard Graham Leigh and created a unique range of handmade crackers. Their Irish brown bread crackers now form part of the M&S heritage range of artisan foods. Driven by their passion to bring great tasting, authentic and unique foods to their customers, Sheridans Cheesemongers has played a key role in the development of the now thriving Irish food scene. I was a little bit disappointed with these Brown Bread Crackers, I expected them to taste a little like Irish Soda Bread which I really love, but although they were pleasant enough wholemeal crackers, but nothing that was very different from other crackers. 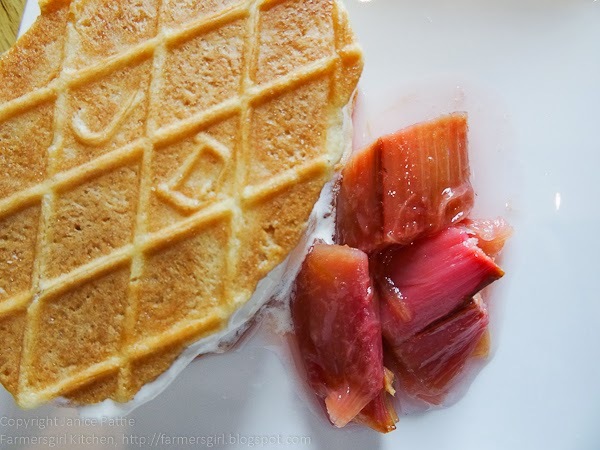 Love these roundups, but I have to say I am most excited by your ice cream sandwich with rhubarb compote. Mmmmmmm! The crisps sound good, I do like an English product and the hoisin flavour sound nice. Drawn also by the elderflower drink! You have quite a haul there Janice and I will check out you ice cream sandwich which sounds good. Ooh what a lovely selection Janice and I'd say a big yes to pretty much any of it - make that all of it '-) Jules Destrooper is one of my absolute favourites of the biscuit world - mmmm!